For the design of Gaia Ashram we use Ecovillage, Permaculture and Deep Ecology Design Principles. For implementing the physical landbase design we try to be aware of the process that is involved in implementing every design step and we try to attune to the land and all beings during this process. 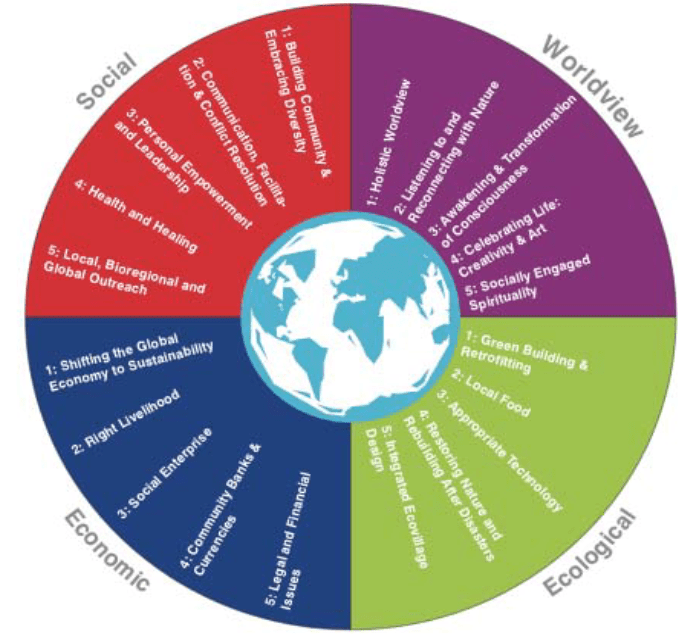 We have a dream and belief that human beings will learn to live in harmony with nature, learn to see that all beings are part of one big family, sharing the same home and that all beings have their roles to play in maintaining and sustaining– the web of life. Therefore, all beings deserve respect. Gaia Ashram aims to be a place where we live holistically, practice and realize the interconnectedness and the oneness of all living and non-living beings. Gaia Ashram is a place where in our daily life we consciously and mindfully observe and interact with nature and with each other in order to develop a deep sense of interconnectedness. 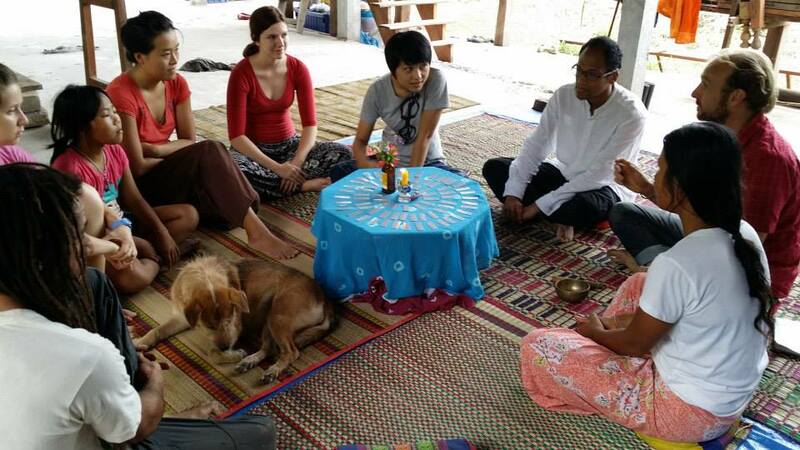 Gaia Ashram encourages the inhabitants to do their spiritual practice and work on healing. It is open for different kind of practices that are non-violent for oneselves and others. In our daily life there is a space to practice yoga, spiritual dance, Tai Chi, Reiki and attunements. We will also hold a yearly Ceremony of all Beings where we will dedicate our actions to all beings. We aim to connect and work with nature on a deep level. Gaia Ashram works with nature, our aim is ecological restoration and encouraging biodiversity. One of our area of focus in the ecology aspect is re-forestation on empty and degraded land around us and on the 2 hectares of the Gaia Ashram land itself. 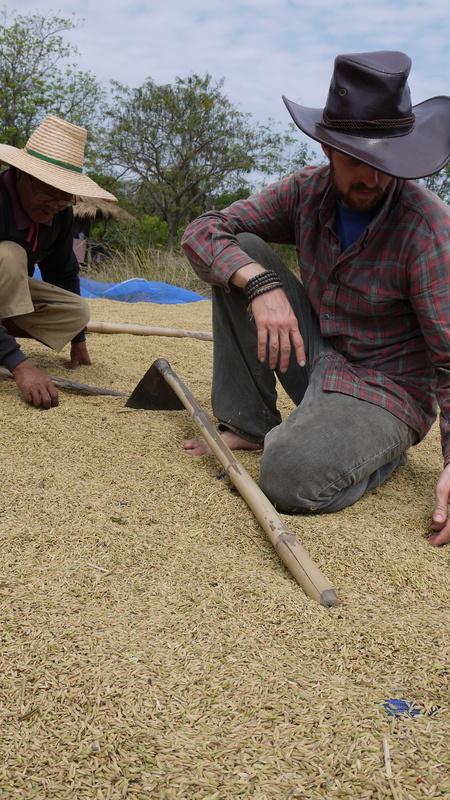 The land where we are building the Gaia Ashram has been used for growing rice. When we got the land for the project we left it to regenerate for one year without any human activity and we only came to observe natural activities happening on the land. In this year we observed that nature has an amazing ability to restore and heal herself. After this we started helping nature by putting more trees and plants to create more diversity and biomass. Gaia Ashram is located in an area where flooding and drought can occur and it’s designed to be prepared for both scenarios. The structure of the landscape is designed to store the water in the landscape during rainy season which can partially be used in the dry season without disturbing the natural system of the land. All building within the ashram will be natural buildings using local materials and reused materials such as earth/adobe, wood and bamboo. We try to minimize the use of non local material. We wish to eventually have all our energy needs, within the Ashram, being met by alternative energy, such as solar energy, within 5-7 years’ time. Waste management will be a focus of the Ashram. We will reduce, reuse, recycle, repair, rethink and remind ourselves of the waste problem and make continues efforts to work on the waste problem and find creative ways of solving it. Waste is a big issue in our consumer society and Gaia Ashram considers the waste issue holistically and will spread awareness about the waste problem and will create waste management systems that are replicable in the village and other places. We encourage the Gaia Ashram inhabitants to find balance between socializing with others in the community and mindfully spending time alone with nature and reflecting with oneself. We have a communal kitchen where every meal will be prepared together. Communally, all the members can spend time together over meal times, we will work together in the garden or other kinds of work, there will be weekly check-in and sharing. We will have monthly celebrations (full moon celebration), we observe the moon calendar and during the Buddha days we have a contemplative day where we do fasting. We also have exposure trips & wilderness retreats together. We also respect each others individual space and we encourage people to work in the garden by themselves at times to connect to nature. Eventually each inhabitant will have a simple house and their own living space. Each house will be surrounded with a garden and trees. Each inhabitant will be in charge of the garden surrounding their house. For the land of 2 hectares we aim to have 5 inhabitants and open for 5 volunteers at a time. Gaia Ashram is surrounded by farming communities, building relationship with the communities is an important aspect. Gaia Ashram is also a learning center for local children and youth. Gaia Ashram is the home of Gaia School Asia which works with local schools in providing educational programs to school students such as the annual Nature Youth Camp program and developing other programs such as Nature in English – and Nature Kids Ambassador programs, Gaia School Volunteer Program (The Nomad Teachers). Gaia Ashram also aims to be a local and international learning center for Ecovillage Design Education (certified by Gaia Education), Permaculture for local farmers, Sustainable Living, Organic Agriculture, Deep Ecology, Nature Connection, Holistic Worldview and Socially,Ecologically Engaged Spirituality. Gaia Ashram inhabitants are encouraged to take any course they are interested in for their personal development and empowerment. At Gaia Ashram the inhabitants will work together to produce their food. Gaia Ashram aims to demonstrate productive organic farming that will inspire local farmers. The Ashram is surrounded by communities of local rice farmers and most of them produce rice for selling. Rice cultivation is the main source of income and local farmers are at risk as the prize of rice is uncertain while the cost of fertilizers, pesticides, labors, petrol for pumping water is increasing. Every farmer around the Gaia Ashram is indebted. The Gaia Ashram land is devoted by the Jamwiset family who are local farmers and wish to see sustainable agriculture that is productive and empowering. 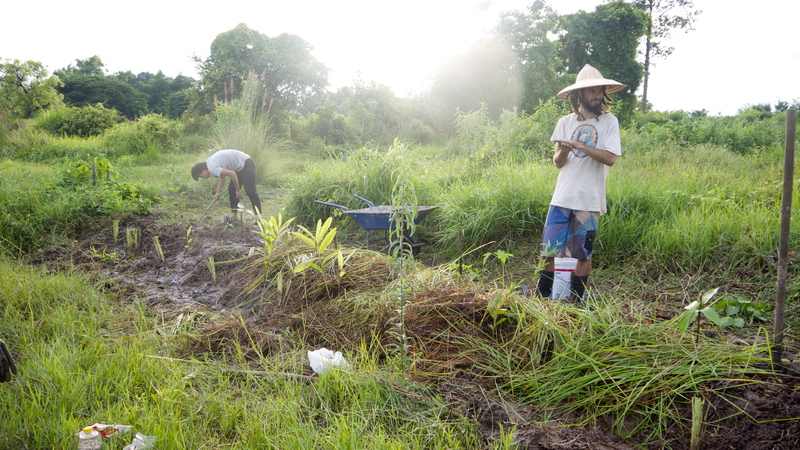 Therefore, to find and demonstrate a productive sustainable agriculture practices that is suitable for local farmers in this area is one of the main missions as part of the the economic aspect of Gaia Ashram. Diverse crops: As mentioned in the ecological aspect we aim to increase the biodiversity on our land and possibly others lands as well. On the agricultural land of Gaia Ashram we aim to produce diverse crops in terms of vegetation and herbs to be sold in local markets, Small food shops, restaurants, schools, hospitals and direct sell to household within 20 kms distance from the ashram is our main market target. By doing so, we hope to inspire local farmers to diversify crops on their land. We will create a market for our crops and we believe that once local farmers see the market for organic crops that is nearby and easy to sell it will encourage them to also grow and sell organic crops. Gaia Ashram will work with local government in creating a market (the market has already been created by the provincial office but not yet active), we will also be providing training and education on organic farming and encourage local farmer to use their local wisdom. Organic products: We aim to produce organic products such as herbal teas, herbal medicines, natural products for domestic use. We will grow organic crops and buy organic crops from local farmers to produce our organic products. In this way, our business will encourage local farmers to diversify crops on their land and practice organic farming and at the same time it will achieve our goal of creating more of biodiversity on agricultural lands around the Gaia Ashram. While developing our business we will also provide trainings for local farmers on sustainable agriculture, social enterprise and other specific knowledge/skills according to their interests and for them to be able to diversify crops on their land. We will use Participatory Action Research (PAR) to raise awareness and find out what their needs are through a needs assessment. For this educational program we will collaborate with the local government offices that have already started training the farmers on compost making and building soil. When the farmers gain more understanding, knowledge and skills on sustainable agriculture and green business, our further business plan will be developed with participation from the farmers. In this step we will develop sense of ownership among the farmers in the business as they will become stakeholders in the business. Beside organic products we will also include handicrafts products from the farmers in the market such as bamboo baskets by the men, Lilly Matts made by the women, cotton fabric, etc. Gaia Ashram will work together with local farmer in market research, creating market and developing products. Training local youth and farmers is our outreach projects. Beside that Gaia Ashram will also host international courses as mentioned earlier. Part of the profit share of every course that will be organized at the Gaia Ashram will be saved for supporting our outreach projects and Gaia School Asia. The design of the land and the implementation of the design will be over the next 10 years. At the moment the Gaia Sala is being built and other structures will be added as time progresses. Gaia Sala – Dharma Sala : Is a training hall where we run workshops and courses. The first floor is indoor class room built with earthen bricks. The second floor is open wall with wooden floor. The second floor is provided as temple or sacred space for meditation, yoga etc. Gaia Home: The dormitory can host up to 50-60 people with enough space for each. One room at the first floor of the Gaia Hall is designed to be a home theatre for educational movies. Guesthouse : Gaia Ashram will have only one guesthouse. It is designed to have 2 bed rooms. It is for teachers/facilitators of workshops/training and when no courses are run it can be rented. Life café : includes an organic shop that sells organic and local products, book store, coffee and smoothie bar, and a dining and chilling out area by a lotus pond. Three to four houses for the inhabitants of Gaia Ashram : located in the farming area. The Fairy Garden: flower & herb garden to create healing energy. Gaia Ashram encourages the inhabitants & visitor to use herbs and spend time in the herb garden to be re-energized by the healing energy radiating from the fairy garden. The designed and creation of the fairy garden will be designed and worked on with positive energy such as Love, compassion, joy, deep connection, celebration, trust, faith, etc… On the process of creating the Fairy Garden we will be consciously building these positive energy before, between and after. It is an experiment. The Shambala training field: a grass field (lawn) for Intuitive Martial Art practice and other outdoor practice susch as Tai Chi, Qi Kong etc. The field is designed to be protected and somewhat hiding. Agricultural land: includes Vegetable gardens, food forests and organic rice growing. Agricultural land of Gaia Ashram is within the 2 hectares and some other part of the Jamwiset’s agricultural land. We intend Gaia Ashram to be a place where we can learn with each other to re-connect with nature. We intend Gaia Ashram to be a place where we can work on our spiritual growth, where we can heal ourselves and support each other in this process. We intend Gaia Ashram to be a place where we can learn to live in harmony with nature, each other and all beings. We intend Gaia Ashram to be a beautiful space that is full of nurturing life giving energy. May all beings be safe! May all beings be peaceful and healthy! To learn more about Gaia Ashram like us on Facebook!